7-day Alaska sea kayaking trip, sea kayaking in Seward Alaska's Kenai Fjords National Park's Aialik Bay, one of Alaska's most diverse sea kayaking destination. 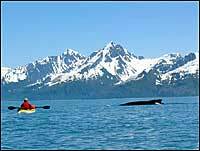 Seward sea kayak trip departing Anchorage, Alaska includes whale watching and tide water glaciers. A BACKCOUNTRY SAFARIS EXCLUSIVE, COMPARE: Choose to paddle a "single kayak". Includes dry suits to keep you warm and dry. Includes the pre- and post-trip transportation to Seward from Anchorage, Alaska and the lodging in Seward before and after the kayaking trip. Take a look at our Aialik Bay Photo Album and see how amazing it is. 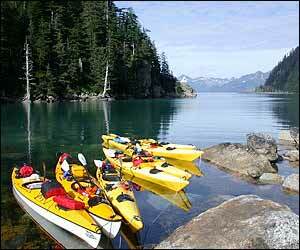 Our most popular multi-day wilderness camping Alaska sea kayaking adventure. 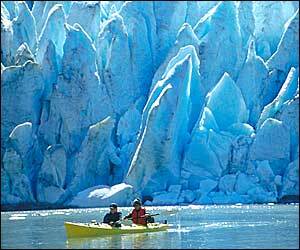 Aialik Bay is a sea kayaking paradise, famous for calving glaciers and abundant wildlife. Located in Kenai Fjords National Park, a visit to Aialik bay offers 3 tidewater glaciers. You'll witness the awesome power of calving glaciers, kayak among icebergs trapped in a lagoon, sea kayak through rock arches, and see waterfalls cascading down sheer granite walls. 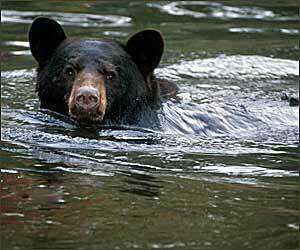 Wildlife often seen include, Orca whales, humpback whales, harbor seals, sea otters, black bears, mountain goats, bald eagles, the endangered Steller sea lion, and a variety of marine birds, including puffins. This is an all inclusive package that includes transportation from Anchorage to Seward, Alaska, the gateway to Kenai Fjords National Park and the pre- and post-trip lodging in Seward. 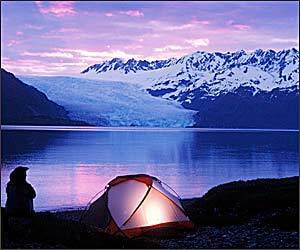 On request we can also include lodging in Anchorage, Alaska your arrival destinations to Alaska. With most air flights arriving in Anchorage, Alaska this package departs from Anchorage and simplifies your travel planning. With other Alaska sea kayaking adventures you're left on your own to figure out how to get from Anchorage to the sea kayaking trip departure locations and that added expense. This Aialik Bay Kenai Fjords National Park 7-day sea kayaking camping adventure provides a complete tour package; transportation to and from Seward, pre- and post-trip lodging in Seward, and combined with of our 5-day Aialik Bay sea kayaking wilderness camping trip. 5 days kayaking gives you time to gain an intimate understanding of this magical place. We think this is the single best overall sea kayaking camping adventure we offer. Anchorage Departure - Transportation to Seward by the Alaska Railroad and motor coach back to Anchorage. 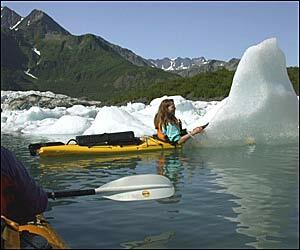 Seward transportation and lodging is combined with of our 5-day Aialik Bay sea kayaking camping adventure to give you a complete sea kayaking tour package departing from Anchorage. This 7-day Seward sea kayaking adventure includes 5 days sea kayaking in Kenai Fjords National Park's Aialik Bay, one of Alaska's most diverse sea kayaking destinations. There are 3 tidewater glaciers that flow into Aialik Bay, and the area is well known as one of Alaska top wildlife viewing hotspots. We often see humpback whales and pods of orca whales and sometimes we get quite close to them. Dall porpoise, harbor seals, sea otters, black bears, mountain goats, bald eagles, and a variety of marine birds including puffins are also commonly seen. We'll sea kayak through rock arches while we explore the rugged coast of this fjord. Three immense glaciers flow into the ocean and we explore them all. 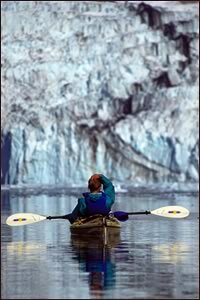 You'll sea kayak among icebergs trapped in a lagoon and witness the awesome power of calving glaciers from the best seat in the house, your kayak. You'll see lots of waterfalls cascading down sheer granite walls. You can even sea kayak under waterfalls, if you're bold. Day 2 - Breakfast on your own. Our guides will pick you at the hotel and with team effort we will load our sea kayaks and gear onto an ocean charter vessel for a 4-hour marine wildlife and glacier cruise to our first camp. Along the way, we round Cape Aialik, pass Caines Head, Bear Glacier, and a Stellar sea lion haulout. We'll set up camp, then devote the rest of the day to sea kayak safety and instruction as we paddle around our new environment. Day 3 - Today we paddle up to the face of Aialik Glacier and take a long lunch break to watch the glacier calve and watch the seals playing on the icebergs. 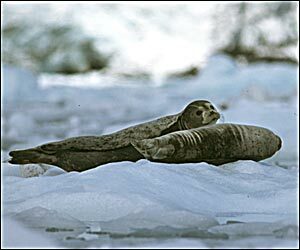 After lunch we head for Pedersen Lagoon, which is used by harbor seals to escape from orca whales. 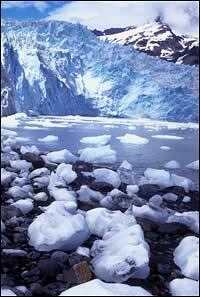 A beautiful glacier empties into an upper lagoon filling it with massive icebergs. 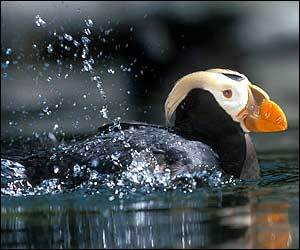 This area is teeming with wildlife including bears, eagles, waterfowl, shorebirds, sea otters and harbor seals. Wolves and coyotes have also been reported in this area. Day 4 - Today we head out toward the open ocean and paddle around Holgate Head and back into Holgate Arm, setting camp up on Holgate Beach. Day 5 - We will paddle our way to the end of the fjord to visit the Holgate Glacier, the last of the three tidewater glaciers in Aialik Bay. We'll sea kayak through ice and "bergy bits" in front of the active glacier and watch it calve into the ocean with a thunderous roar. Day 6 - We break camp early morning and if you choose you can go for a short paddle near camp while waiting for our charter boat to arrive for our ride back to Seward. Our shuttle driver will meet us at the dock and take you to back to your hotel. Day 7 - Breakfast on your own. Meet the bus at 9:45 a.m. for your trip back to Anchorage. Along the way you will pass through dramatic valleys of the Kenai Mountains and keep a watch out for bald eagles, beluga whales and Dall sheep on this National Scenic Byway. 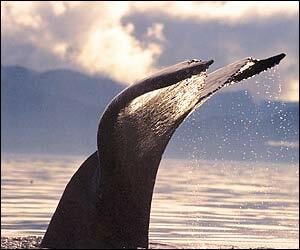 You will arrive in Anchorage around 1:30 p.m.
A Backcountry Safaris exclusive package departing from Anchorage. Includes the pre- and post-trip transportation to Seward from Anchorage, Alaska and the lodging in Seward before and after the kayaking trip. Additional savings are available by choosing optional hostel dormitory style accommodation in Seward.